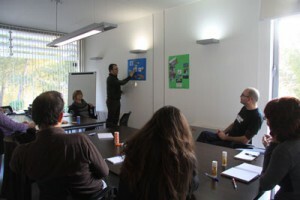 On January 25th we started the third TalentLab, workshop, “Listening to the Earth”. The place was the Ebre Observatory (Observatori de l’Ebre, CSIC-URL). As participants arrived they organized themselves into two groups, trying to find a balanced representation of backgrounds in each one. 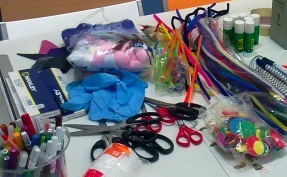 We introduced the workshop and the structure of the session, and we set ourselves to work. First, to warm-up an spark inspiration, we put in common with all the groups the general context of climate change. We used images for that, ensued by a collection of the ideas that the images inspired to each participant. The first group emphasized the different scales (local, global) that we confront climate change and water problems. Also, they remarked the risks associated with water. It is a desirable and needed resource but it can also bring danger or disaster situations. 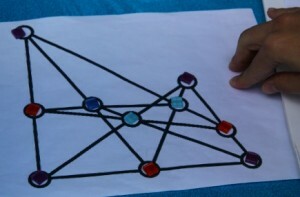 The second group suggested to visualize that the “path” to follow from one situation characterized by disasters (by natural or anthropic causes) to another, idealized, one where human action were harmonious with the natural environment, should go through the filter of scientific thought. This started a discussion with the first group. They thought that, nature (including big scale natural phenomena) had been harmonious before the human hand acted on it. We interpret that the “path” suggested by the second group wished to portray the ideal of a new rationality, a scientific thought that would act in a better accordance with the natural environment. After this, we moved on to imagine future scenarios. Both groups focused on the local scale. The first one created a front page for the local newspaper (“La Veu de Roquetes”), for January 25th 2030. Headlines focused on water issues. Restrictions were damaging agriculture and the North-South water transfer had become obsolete. Energy also made headlines: they mentioned that oil was no longer the primary source of energy. They also reflected that life expectancy had reached 100 years. 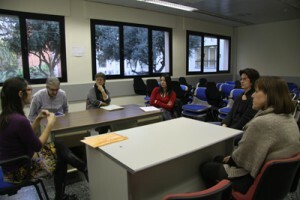 The second group created a front page for the newspaper “Lo Sud”. The headlines emphasized the migratory movements originated by climate change (“Emergency world summit to solve a catastrophic situation: Norway reaches -30 Celsius and the Andalusia desert is offered as a relocation places for the displace Norweigan population”). They also mentioned the relevance of gene medicine to eradicate diabetes. The launching of a reusable space rocket was the last headline of “Lo Sud”. After getting a view of the future, we moved on to imagine which type of user is hypothetically going to use the pedagogical contents resulting from Talentlab. 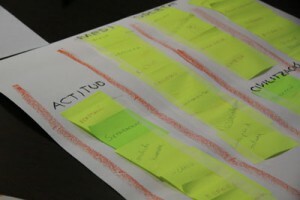 Participants remarked user features related to general curiosity, as well as their interest in sports and culture. Also, a strong interest in using new communication technologies, specially Youtube. This started a short debate about the educational potential of this channel for science teaching. Different possibilities were mentioned. For example, its usefulness in showing scientific phenomena that are difficult to replicate in the classroom or, how to produce content for that channel. Also, how to get students into creating videos with experiences that they can upload to Youtube. In any case, it was clear that participants considered the channel as something to have into account. 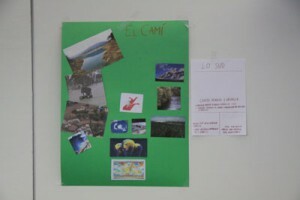 In order summarize the ideas that emerged after these two activities, both groups created very comprehensive “paintings” that remarked the need to integrate natural and scientific aspects with social and economic considerations. The second group also depicted the need to introduce attitudes. From this moment on, each group sketched an idea for an educative resource. The first group suggested the creation of a platform (wiki, blog, video, etc.) to work on the local effects of climate change. It should integrate scientific information (Physics, Biology, Chemistry, etc.). 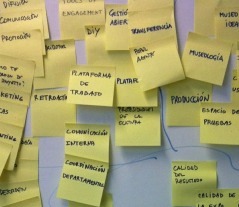 The second group suggested an “in situ” visit of the places and situations that users wished to get to know. Also, they also suggested graphic representations as a possible means of integrating knowledge and learning. For example, by using infographics, videos and other visual content.There are many things to be defined still. Nevertheless, it seems that there was a certain convergence towards the integration of different types of knowledge, to focus on local realities and the use of visual means. Let’s see what happens in the next meetings and how the initial proposal evolve. On November 30th, we performed the second session of the ”React with the environment” workshop, at the Institute for Environmental Diagnostics and Water Research (CSIC). This time, all the participants sat around a table to share the highlights of the proposals that were presented in the previous session in order to design a unique proposal. The need to create a resource that encouraged students to perform some type of research was highly mentioned. On the other hand, it was also stresses the need to look for subjects that students could find interesting and relate to everyday life. It was also spotted that this research had to be performed in small groups and it had to be independent of the research center. However, it was said that the educational resource could be adapted so the most interested students could extend their knowledge on the topics through a more extensive research project. We discussed the topics that could be the source of these first level research projects. We chose three main areas: pollution, health and nutrition. Therefore, it was proposed to develop three research projects to address some environmental contaminants such as mercury, the trialometans and TBT (tributyl tin), and its effects on living organisms. 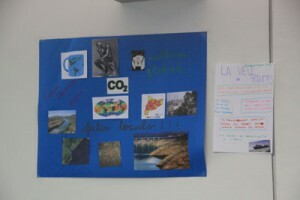 The first two projects were thought for students at high school level and the third project was thought for students who are at 4th ESO grade. There would be the option to make some adjustments to adapt the projects to the Science for the Contemporary World school subject. It raised the idea of ​​collecting information on the diet of the students in a class and relate it to the presence of organic forms of mercury in their hair, in order to work on the analysis of the accumulation of mercury in the food chain. To make this analysis we need to use some laboratory technique at the IDAEA. A few students and a teacher could go to the research center to visualise the process and then share it with the rest of the class. The second projet would consist in a collection of real data on the trialometans presence in chlorinated water (eg swimming pools) that CSIC could provide to students. 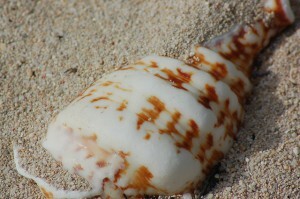 Finally, the third proposal consisted on studying the TBT compound (used in paints for boats to avoid algae and other organisms) through the IMPOSEX effect in a kind of a marine snail. From the observation of many samples obtained in markets, students could study the phenomenon of masculinization of these snails. It was suggested that the three research practices had an area of ​​documentation, a protocol of the test to be performed and/or some data to be analysed. We also talked about the possibility of students publicating their results. In addition, the educational resource could combine these three research practices with short videos and some visits to the research center. The researchers suggested that visits to the center could be concentrated twice a year during the first and the second term. Now, we will continue working on the adaptation of these three educational proposals, which already have a high degree of precision, into a digital educational resource.